One of the most intriguing books this vintage radio historian has read rolled recently from McFarland’s presses. It approaches the spectrum in a way we’ve not seen in a while, concentrating on audience draw for major series over a couple of decades of the Golden Age. 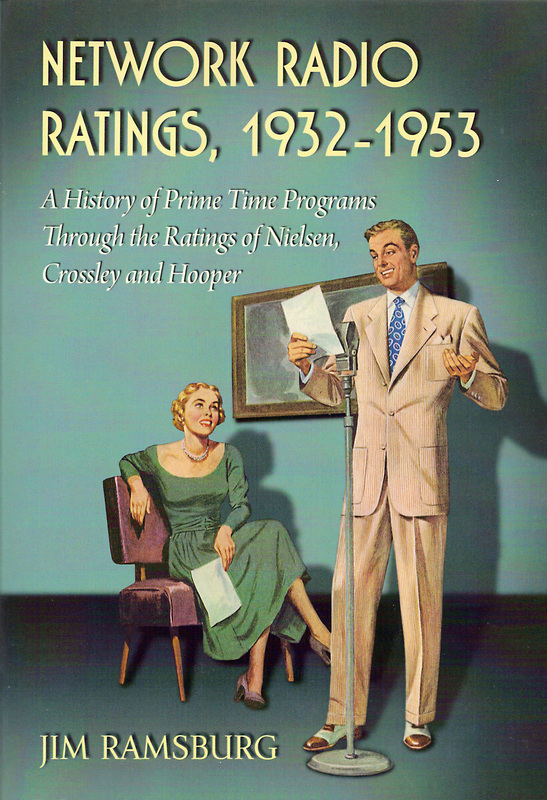 Network Radio Ratings, 1932-1953: A History of Prime Time Programs Through The Ratings of Hooper, Crossley and Nielsen was authored by Jim Ramsburg, a retired broadcasting and advertising practitioner. Far from what you’d anticipate from the title it’s anything but dull, dry and distasteful. On the contrary, every page of Ramsburg’s manuscript lights up with sparkling metaphors and alluring content that helps readers put into perspective why the numbers fell as they did. In other words, it’s not a data bank by itself; well over half is text matter tripping along in a lighthearted style that you’ll find not only informative but entertaining and amusing as well. …Pure and simple, this is a history book, but an incredibly interesting and detailed one. Even for those who don’t particularly care for such accounts, a love of old time radio will probably turn them on to Ramsburg’s Network Radio Ratings, 1932-1953.